natalie's sentiments: Taking control of my "collection"
I needed to take control. I had an idea to use some extra space in my closet to display some of my collection. I told Shane what I wanted and he headed over to Lowes and picked up some supplies. A few strips of molding and a couple boxes of white hooks. 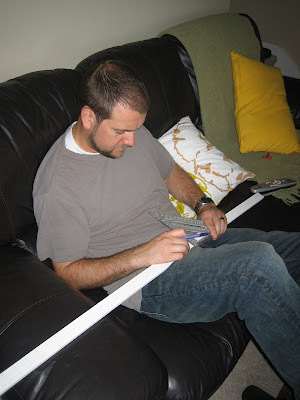 Shane measured one inch increments and drilled holes for the hooks. Chaos at bay. All for under $15. Wow, very impressed and jealous! Great job! I love how simple this was to make! I mean, you do always look great, but seriously. You have your own boutique in your closet! Oh my word...I am so jealous of your collection!! I love how you have it organized...so beautfil! I am so jealous! I am a jewelry lover too, but I'm not even kidding when I say I own 1 necklace and 2 pairs of earrings! And the earrings I just bought a few weeks ago on clearance at Target for $3! I can't imagine having a collection like that! Love how its organized now! I am impressed! Oh, how I wish I could get this organized. It was fun to see your new necklace hanging in the collection. :) I hope you're enjoying it! How lovely! I love displaying my jewelry as art, too. Although, I'm not nearly as creative as you. Great idea! I love your jewelry collection. What a great idea. Hmm . . . I don't have one cocktail ring. What does that say about me? 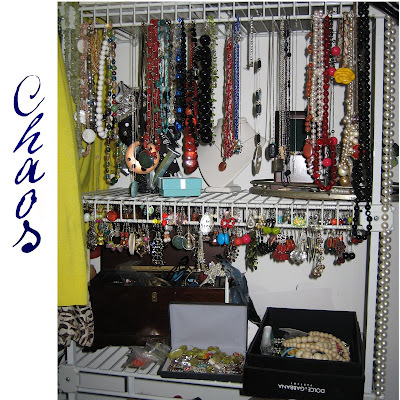 I make a lot of my own jewelry too, and it is not as organized as yours. Can't wait for the big giveaway day! Maybe I'll win THIS time . . .
WOW... you have a FUN collection... LOVE it! Wow! Your closet's like a jewelry shop! Can I go shopping sometime?? I love how organized it all looks. Nice job! I love it!!!!! 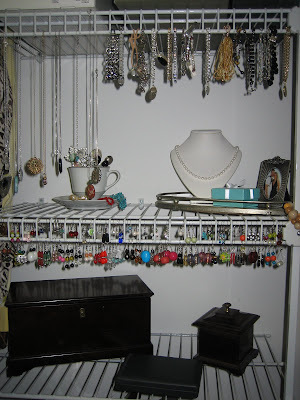 I need jewelry organization bad!!! This looks great!!! I need a system like you. 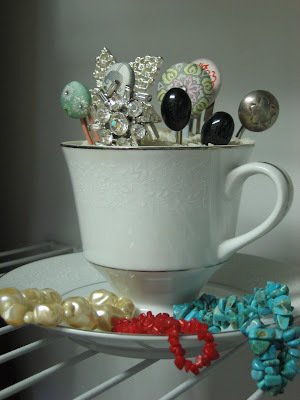 I have lots of jewelry but always find it hard to locate! I was just thinking how I need to go to Hobby Lobby to organize all my jewelry. I am trying to start to accessorize more and hope to build up my collection.